Chennai: Tamil Nadu government said it was firm on ensuring that the proposed AIIMS was set up in the state and has suggested Thanjavur for the Rs 2000 crore central project, aimed at providing a boost to tertiary care services. Chief Minister K Palaniswami was responding to Opposition DMK, which raised the matter in the state Assembly. DMK Member K Ponmudi, a former Minister, sought to know why the Chief Minister had recently recommended to Centre that the proposed All India Institute of Medical Sciences (AIIMS) could be set up in Chengipatti in Thanjavur district. He particularly referred to demands from within the ruling party, including a Minister, for establishing the project in their respective districts. A Central team had in 2015 visited Thanjavur, Pudukottai, Madurai, Perundurai (Erode district) and Chengalpattu (Kancheepuram) scouting for land for the 200-acre project. The ruling members had sought the project in their district, only with the aim of benefitting the people there and nothing else,” Palaniswami said. The Central team had earlier mentioned “some shortcomings” at each of the proposed site and “there was an opinion” that Chengipatti in Thanjavur could meet all the requirements. “To ensure speedy implementation of the project and that it does not go out of Tamil Nadu, we had mentioned Chengipatti (in the communication to Centre),” the Chief Minister said. 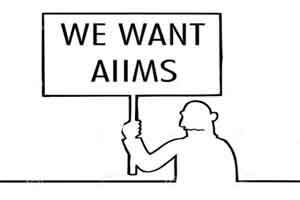 The government’s stand was that Tamil Nadu should get the AIIMS project, and in any one of the locations proposed in the five districts, he added. Interestingly, DMK MLAs hailing from different districts, were seen demanding allocation of the project to their respective districts during the discussion today. The Centre had in its 2015-16 budget announced establishment of AIIMS in Tamil Nadu and other states.